Following our discussion of all the goodness found in the Pinot Project Pinot Noir, my fabulous cousin-in-law Laurie suggested I give Red Bicyclette Pinot Noir a pour. I picked up a bottle, and enjoyed each glass as I ate dinner, watched a Rangers game, and wrote my review. Then as is my usual fashion, I went online to examine the winery/producer in order to include some facts on production, and in this case, to confirm what the varietal composition of the bottle is. [Many times there are small percentages of more than one varietal of grape that has been included in the bottling, even though it may not be stated on the label, as was the case here.] I discovered some interesting facts, varietal composition, and controversy. The controversy materialized as a result of Red Bicyclette sourcing their grapes from the Languedoc-Roussillion region in France. 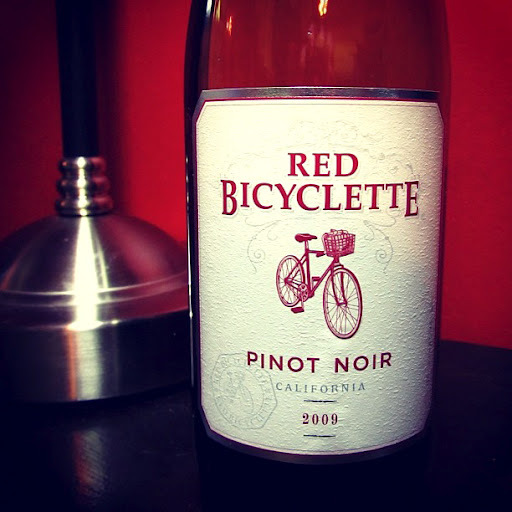 Between January 2006 and March 2008, 8 French vintners and wine cooperatives sold what Red Bicyclette [E. & J. Gallo are the actual importers] believed to be Pinot Noir, but in fact was intentionally mislabeled and was a blend of Merlot and Syrah. The French were charged and convicted with deception and forgery. And herein lies the controversy, Red Bicyclette did not recall the mislabeled wine. They did issue a statement saying that they felt the only wine affected that they sold would have been the 2006 vintage and previous. They stated that it is impossible to chemically test wine for its varietal composition. This statement is pretty shaky, and apparently only holds any truth when the wine has been blended with more than 10% of other varietals. However, even with a couple of incident-free years under their belt now, some people still contend that their French grape derived Pinot Noir doesn’t taste like Pinot Noir. I found it to be consistent with a Pinot Noir blended with 2 other varietals, as was stated on the website, but missing on the bottle. Translucent garnet with brilliant ruby highlights, after aerating a bright raspberry aroma arose from my glass. Clean fruity flavours of strawberry and raspberry with mingling notes of warm vanilla filled out the medium body. Well-composed, soft tannins introduced the lengthy, smooth finish of spicy pink peppercorns entwined with hints of cherry. Easy drinking and pleasant, and with or without the controversy, it makes for an enjoyable glass with a meal or on its own.